IS YOUR MUSIC IN CHINA? FIND OUT NOW! [Jyväskylä, Finland, April 2, 2019] Searching for digital music copyright in China is free and accessible for everyone from the China search on the Musicinfo home page. If the user has ever tried to find their copyrighted music from China they have probably found that the site was not accessible or in Chinese. This web-based app will collect data from the two biggest music streaming services in China with the largest catalogues of digital music, Tencent QQ and Netease. With just an artist or song name the China search will return any tracks and associated albums from these two services. It can then be checked if this matches with the users’ own distribution records. 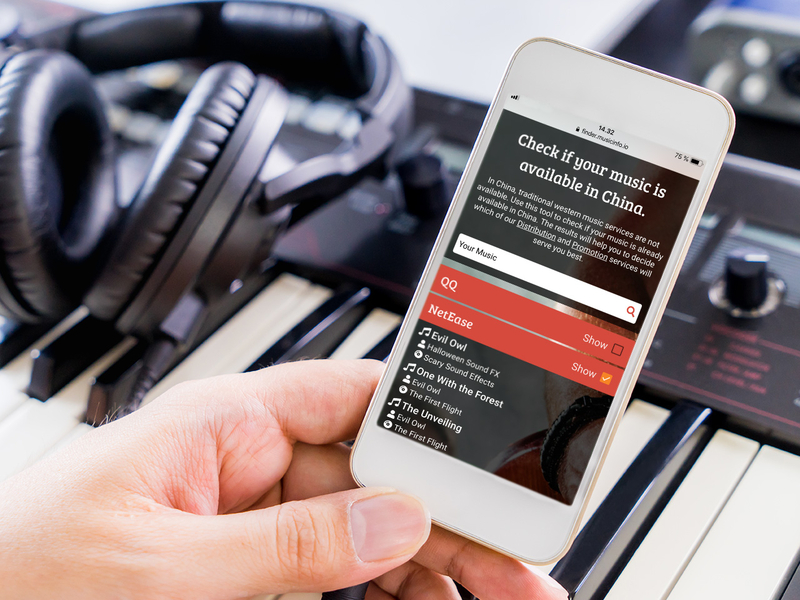 Musicinfo developed the China Search app to make it possible for anybody to access these digital music catalogues in China without fuss. It is also Musicinfo’s contribution to crack down on illegally consumed music and bring awareness of huge new audiences for all their customers. How has my music gotten to China? If the users’ music is found on one of these services it most likely means that their music has been knowingly distributed to China. It may also mean there is a record of their music not available for consumption from these services, meaning no audio files, but somewhere else in China. Musicinfo keeps no records of the users’ music or knows why the music may be in China unless it has been distributed with Musicinfo. The copyright holder has the responsibility to either legally distribute and collect royalties or pursue the removal of their music. If music has ever been distributed and the user wasn’t 100% aware of the terms and services of their provider they might have unknowingly distributed their music to China. So if the user has ever changed their distributor or hadn’t followed the updates of their current distributor, there may be unclaimed copies of their music floating around. The user may lay claim to these illegal copies by distributing their music with Musicinfo. Piratism is also a possibility but is rare, according to The International Federation of the Phonographic Industry ifpi, 96% of music consumers in China listen to music legally, compared globally at 62%. This is evidence that copyright security works well in China. A powerful tool for everyone. Developed with the vision of providing a free valuable tool available for everyone. Music professionals no longer need to struggle with trying to translate and navigate Chinese based websites when using China search. Kari Halttunen the CEO of Musicinfo feels that, “At Musicinfo we believe everyone has the right to be 100% connected to their music and get 100% of the royalties. Time is the most valuable commodity today, let Musicinfo work for you to get the best value for your music and your time.” Musicinfo will helps navigate the digital jungle towards China’s enormous lucrative digital music market.